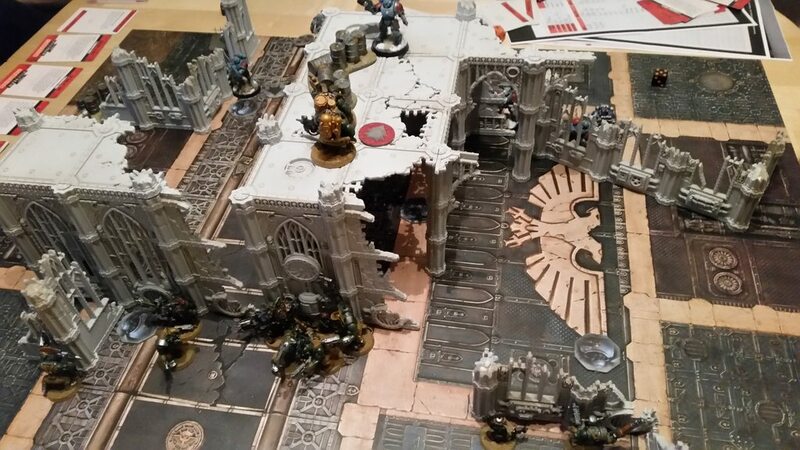 So I finally had a chance to play the skirmish game, Kill Team which is based in the Warhammer 40,000 universe but much smaller scale skirmishes than a standard 40k battle. The intention here is for multiple missions to be played as part of a campaign, with certain characters in your squad gaining experience and new skills as the campaign progresses. Eventually a team will run out of a resource and the other team wins the campaign. As a nice bonus, you can play missions with 2, 3 or 4 players, which is a nice option to have. My first campaign is my force of Orks versus the legendary Space Wolves. The two 100 point teams, shown above. There are twice as many orks but the space marines are considerably tougher. Games are played over 3D terrain and missions vary from holding points of importance on the board, taking enemies hostage, to breaking the other team's morale. 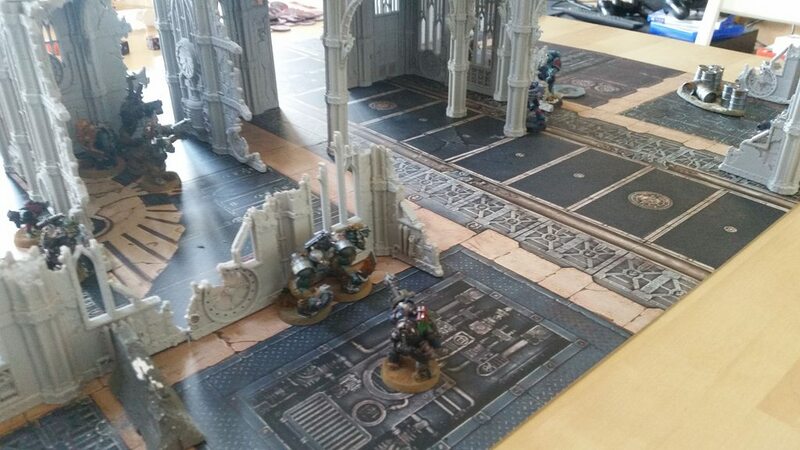 In the first match the Space Wolves were the attacker, while the Orks had to defend points of interest. The Wolves whittled down Ork resistance, successfully destroying several objectives. But luck wasn't on their side, with a marine in a key location about to take an objective, he just about survived a missile attack only to be finished off by a fluke shot by a lowly gretchin. This would not be a major set back, however the game finished early on turn 4 and so the Orks won this mission by the skin of their teeth. The second mission saw both teams looking to take key control points for as long as possible to secure essential Intel. The Space Wolves took the lead early on taking the most important area at the centre while the Orks attempted to take cover. Realising there was no easy path to victory here, the Orks rushed to meet their enemy, risking the deadly fire of the Wolves. Several Orks were cut down but with too many targets, the Orks surged into the lead. Eventually fighting off most of the green skins, the Ork morale broke! But too much Intel was lost at that point and so despite their shattered morale, the Orks took another victory and their big risk push forward paid off. The second mission saw characters on both teams level up to rank 2 due to experience gained and 2 of the Orks killed permanently unable to recover from the savage Wolves. I found the game fun to play, it's one of the easier skirmish games to learn to play but with plenty of tactical choice to keep things interesting. Luck of the dice does play a part but smart strategy plays a huge part. From unexpected flanking during play to choosing the right weapons and skills for the mission. I really love the 3D terrain, looks like a lot of fun. Hope I can get to try it sometime.